The first day of Official 2018 action began wet at Sepang International Circuit, with the majority of the field setting some laps but then waiting it out as the track began to dry. So the season began on wets, before slicks began to appear up and down pitlane. 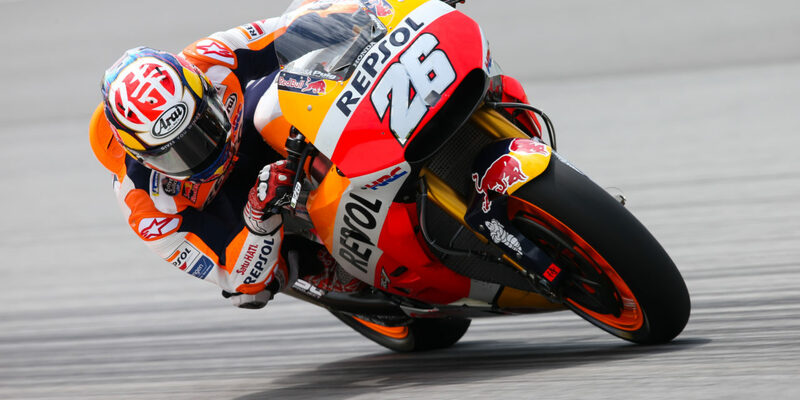 Fastest by the end of the session was Repsol Honda’s Dani Pedrosa, as the pole lap record holder at the track ended the day more than three tenths clear of 2017 runner up Andrea Dovizioso (Ducati Team). Dovizioso’s teammate Jorge Lorenzo was third quickest, just 0.032 in arrears. The tyres available for the test are the same as were allocated during the 2017 race weekend: a soft, a medium and a hard front, and a soft, medium and hard asymmetric rear. In addition, Michelin have brought two new front compounds for the field to evaluate – as well as a rear with a small evolution in the compound. Timesheet-topping Pedrosa and teammate Marc Marquez had 2018 protoype machines as well as 2017 spec R213Vs in the Repsol Honda garage. Pedrosa put in 56 laps and blasted ahead on his final run, with the reigning Champion on the other side of the garage doing 51 and moving up to P7 late in the day. LCR Honda Castrol’s Cal Crutchlow was also testing for HRC with 2018 protoypes and the Brit had three machines in the pitbox. He earned the honour of first crasher of the season, but did also play guinea pig by heading out first on slicks. Crutchlow did 38 laps with a best of 2:00.522 to take ninth on the timesheets. Hot on their heels over in the Ducati garage, and following test rider Casey Stoner’s positivity on the new GP18 after private tests, Andrea Dovizioso and Jorge Lorenzo had both the GP17 and the GP18 with which to put in their laps. Dovizioso spent some time on top before being deposed later in the day, but the Italian charged back up to second overall by the end of action. 35 laps saw the 2017 Malaysian GP winner put in a best of 1:59.770, with teammate Lorenzo also a late mover and catapulting himself from outside the top ten to P3 on his final run. The five-time World Champion did 38 laps. Danilo Petrucci (Alma Pramac Racing) made it three Ducatis in the fastest four as he took P4, just ahead of new teammate Jack Miller, who made it 80% Borgo Panigale factory machinery in the top five as he impressed once again. Movistar Yamaha MotoGP’s Valentino Rossi and teammate Maverick Viñales, meanwhile, began the day with new fairings – but not the new full carbon-black aero package seen on test rider Katsuyuki Nakasuga’s machine. The two men were forces to be reckoned with on the timesheets until a final time attack from some competitors. With the new chassis based on 2016 and the 2018 engine, an optimistic ‘Doctor’ put in 50 laps. The quickest clocked in at a 2:00.233 to put him P6, with teammate Viñales P13 on Sunday after 72 laps. The first man out on wets in the morning, meanwhile, was Johann Zarco (Monster Yamaha Tech 3) as the lights went green, and the Frenchman had some new – to the Tech 3 team – aero to test. He ended the day in eighth after 62 laps. Red Bull KTM Factory Racing impressed once again as they head into their second season. Pol Espargaro was on the pace from the off and completed the top ten, with teammate Bradley Smith in P17. The Spaniard did 39 laps and the Brit matched the count exactly. Test rider Mika Kallio was also on track. After taking a wrong turn with the engine in 2017, Team Suzuki Ecstar were forced to develop around the problem – but now think they’re in a much better direction with their 2018 engine specification. Ex-rookie Alex Rins was their top rider on the first day in P11 after 63 laps, with Andrea Iannone taking P16 but only four tenths further back. Aprilia, meanwhile, were working on weight distribution and improving the power over the winter, re-evaluating their findings with riders Aleix Espargaro and Scott Redding from now on. Espargaro put Aprilia Racing Team Gresini in P14 after 40 laps, with Redding starting to settle in in P21 – taking the lap counter over the half century mark. It was Takaaki Nakagami (LCR Honda Idemitsu) who emerged from the first day as the fastest rookie, riding a 2017 Honda this season and putting in a good amount of laps on Day 1 – 64. He was twelfth overall. Reigning Moto2™ Champion Franco Morbidelli (EG 0,0 Marc VDS) was next up in terms of debutants, in P18 after 62 laps and half a second off the Japanese rider. Fellow rookies Xavier Simeon (Reale Avintia Racing) and Tom Lüthi (EG 0,0 Marc VDS) were also on track, with Swiss rider Lüthi now having successfully completed his first day in the premier class after being forced to sit out the Valencia test through injury.